We watched our neighbour build his beehive, then we watched with interest as he put on his bee keepers suit and transported a whole swarm of bees into the hive. We watched him feed his bees with sugar syrup every day for the first few weeks and daily we observe the bees with fascination as they constantly fly in and out of the hive on a mission, in their hundreds, quickly attacking any foreign bee or insect which is not part of their swarm. And now finally, all of my neighbour’s hard work, coupled with the very hard and clever work of the bees, has produced this…. 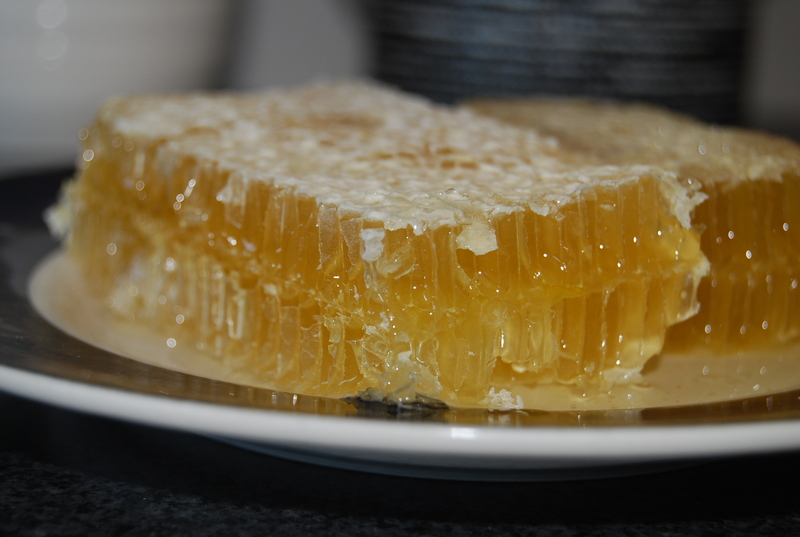 a beautiful and succulent honey comb dripping with honey. Unfortunately I can’t eat it while pregnant, but I will watch with envy as my hubby and family devour it. I don’t think it will last for long. Wonderful photos and a real treat to read all about the farmers markets,felt like i was there!! The honey looks as good as it tastes.Just going to read the recipe for the Bircher Muesli now,i had breakfast at a place called the Vines in Perth a few years ago and the bircher Muesli was the best ive ever had,never been able to find one like it so i will try yours. Thank you for your lovely comment! Yes we really enjoyed the Farmers’ markets 🙂 I hope you enjoy the bircher muesli, let me know how it goes! !